The Spice Island Poker is a progressive Stud Poker game that is connected to several Cryptologic-powered online casinos. In Caribbean Stud Poker, a favorite in the Caribbean and aboard cruise ships, each player plays against the dealer and not against other players. 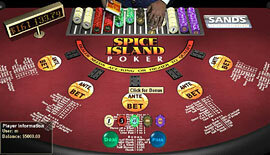 Spice Island game offers its players a chance to win progressive or bonus jackpot or the part of the jackpot. To qualify for the Progressive Jackpot you need to place a $1 bonus bet. Spice Island Poker is played and programmed according to Atlantic City Poker rules with one exception: the payoff for a Royal Flush is 200:1 instead of 100:1. In Spice Island Poker you place an ante, you receive a hand, and the Dealer receives a hand with four cards face down and one card face up. You then decide whether or not you would like to bet if you think you can win or surrender if you feel that your hand is inadequate. If you bet and if the dealer's hand qualifies (contains an Ace/King combination or better), your hand will be compared to the dealer's. If you win, your payoff will be determined by the quality of your hand. For information on payoffs please consult the payoff table below. If you surrender, you will lose your ante to the dealer and the hand will end. To qualify for the bonus Jackpot, you must make a $1 bonus bet prior to playing the hand. The bonus Jackpot starts at $100,000 (for a Royal Flush) and grows each time somebody makes a bet. If you have a Straight Flush (payoff is 50 to 1), you will receive 10% of the bonus progressive jackpot. Your bonus bet is not refunded in case of a bonus payout or otherwise. See complete payout table on the image below. You can also try this game out for free without downloading the software - click the screenshot image below and on the Sands of the Caribbean casino web site choose "Instant Play" (register with your email address). We would also recommend you visiting our Caribbean Stud Poker jackpot winners page to see over 16 real online Spice Island winners and their testimonials, advice, photos and comments.